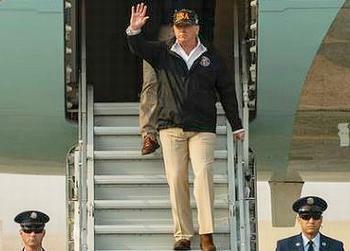 CHICO, California, November 17, 2018 (ENS) – “We will do everything in our power to support and protect our fellow citizens in harm’s way,” said President Donald Trump today on his way to California to view the devastating effects of wildfires that have so far claimed 71 lives and left more than 1,000 people listed as missing. Butte County Sheriff-Coroner Kory Honea said the list of those missing is dynamic and could easily contain duplicate names, unreliable spellings of names and people who fled and do not realize they’ve been reported missing. After threatening last week to withhold federal disaster funds from California because of “gross mismanagement of the forests,” President Trump today changed his tune and offered full support to California during the state’s response to the wildfires that broke out November 8 in both northern and southern parts of the state. 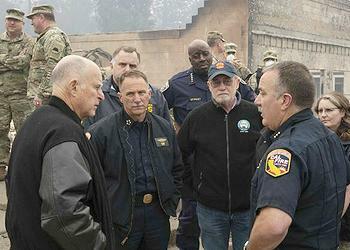 California Governor Jerry Brown and Governor-elect Gavin Newsom joined President Trump Saturday during his visit to the sites of the California wildfires, alongside top officials from the Governor’s Office of Emergency Services, CAL FIRE, the California Highway Patrol and California National Guard as well as local and federal emergency managers. President Trump expressed muted, vague sympathy for those who lost their homes and their lives in the fires. A reporter asked Trump whether seeing the wildfire destruction had altered his opinion on climate change. “No, no I have a strong opinion. I want a great climate. We’re going to have that … because we can’t go through this. Every year we go through this. We’re going to have safe forests and that’s happening as we speak,” he said during a briefing at a command center in Chico, California. Containment of the Camp Fire continues to grow and is currently at 55 percent. CalFire is strengthening containment lines while preparing for the projected increase in winds and the Red Flag warning this weekend. 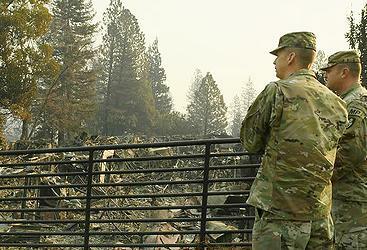 Fire officials said Friday that eight more bodies have been found in the wildfire wreckage that has destroyed 142,000 acres in Northern California. It will take two more weeks to fully contain the devastating Camp Fire, firefighters said, although a forecast of rain next week could offer some relief. President Trump issued Major Disaster and Emergency Declarations to provide support for California’s response to these wildfires. The declarations cover up to 75 percent of costs incurred by California for removing debris, conducting emergency activities and providing transitional sheltering. The Trump Administration has issued three Fire Management Assistance Grants to support partner States that have deployed resources to the region. These grants reimburse partner States for up to 75 percent of the costs they incur by sending firefighting assets and provide funding to California to help mitigate the impacts of future wildfires. The Department of Health and Human Services has declared the California wildfires a public health emergency, giving Medicare and Medicaid beneficiaries and their healthcare providers greater flexibility in meeting emergency health needs created by the wildfires. The U.S. Forest Service has some 590 personnel currently supporting the fight against the Camp and Woolsey fires in California. This includes over 490 personnel to support efforts to fight the Camp Fire and over 90 to fight the Woolsey Fire. USDA’s Forest Service is making dozens of air resources available, including 23 helicopters, eight large air tankers, five air attack units, one night air attack unit, and one night helicopter. The Camp Fire utterly destroyed the town of Paradise, California, a community of 27,000 residents. Governor Brown also met November 14 met with residents impacted by the Camp Fire at the Incident Command Post in Chico and visited the site of Paradise Elementary School, one of over 8,814 structures destroyed in the Camp Fire. The Camp Fire Disaster Recovery Center opened Friday in the former Sears Building at the Chico Mall. The Center will be open daily from 9:00 am to 7:00 pm. The Center will have everything the federal, state and local agencies residents and businesses need to move forward. All residents and businesses impacted can go to www.disasterassistance.gov and register right away. Registration with FEMA can be also done by calling (800) 621-FEMA (3362). Residents can register with FEMA for federal disaster assistance at the center. They can also access information about homeowner’s insurance, steps to rebuild, how to identify personal items, the status of utilities, community and social services, and getting new documents that may have burned in the fire, among other resources. It is not necessary to visit a center to register for and receive federal disaster assistance. If possible, survivors should register with FEMA before visiting a recovery center. To register, go online to DisasterAssistance.gov or call the FEMA helpline at 800-621-3362. Help is available in most languages and phone lines are open 7 am to 10 pm seven days a week until further notice.